Looking at old photos sometimes prompts a memory or gives a blog topic. This one says, “What were we thinking?” on so many different levels. My sister Sherrie came to visit me in New York a few times in the ’90s. We went to Broadway shows, standing in line at the TKTS booth in the cold and snow. And we had dinner at inexpensive Italian or French bistros–I miss Quatorze to this day. We walked and walked and walked. Things were a little grittier then. Times Square still had a rough edge, and the High Line was just some rusted railroad track in Chelsea. We visited museums. 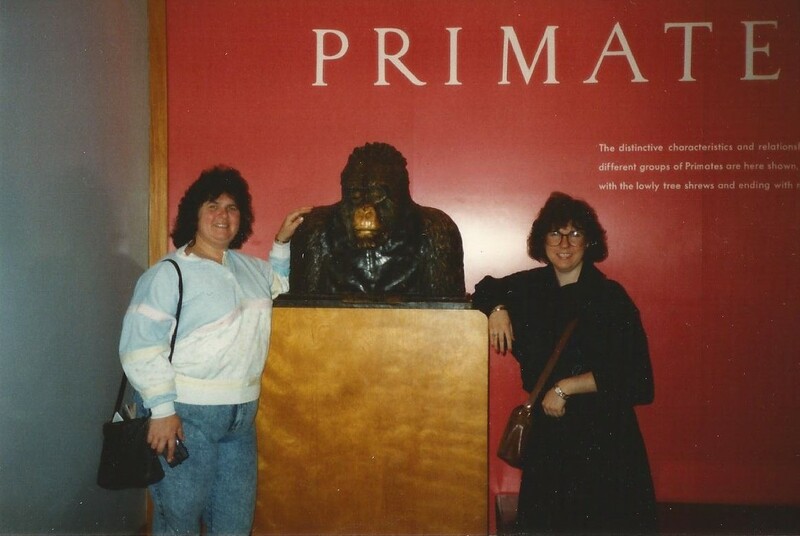 Sherrie was teaching high school biology, chemistry and physics, so we made a pilgrimage to the Museum of Natural History, where this was taken. The main thing that strikes me is, we both had perms. Back then, that was a good “working girl” alternative if you didn’t have time for hot rollers every morning. But what a terrible look! It wasn’t flattering for anyone. If you don’t believe me, just look at Meg Ryan’s hair in “When Harry Met Sally.” That movie still gives me the shivers over how many of those hairstyles I went through! And look at the glasses. I think I was in a contest with myself to see how ugly I could be! I always had fun when Sherrie came to visit. She wanted to get up early and see as much as she could. “We can sleep when we’re dead,” she would say. So off we would go. Sherrie wasn’t snobbish or over-sophisticated or picky. She just wanted to see it all. She’s my favorite tourist.